Pure. Natural. Strong aromatic fragrance. Distinct color. Superior quality. The regular supermarket brands don't measure up to this turmeric! These are a few words used by our customers to describe our Lakadong turmeric. Known to be the best in the world, for its high curcumin content. 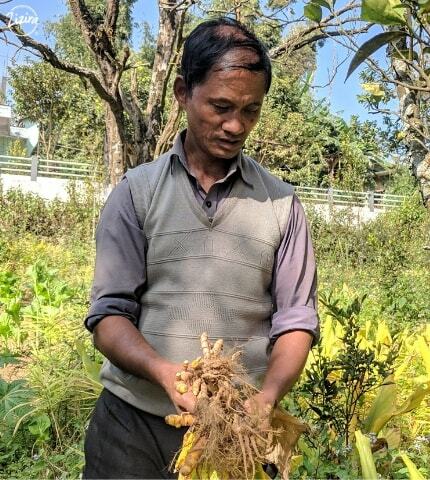 Lakadong turmeric grows in the hilly region of Meghalaya. Revive and regenerate your health with this high altitude turmeric. I want one! What makes it special? Zizira harvests Lakadong turmeric fresh from the fields. This is a 100% pure Lakadong Turmeric. It is not blended with any other turmeric varieties. 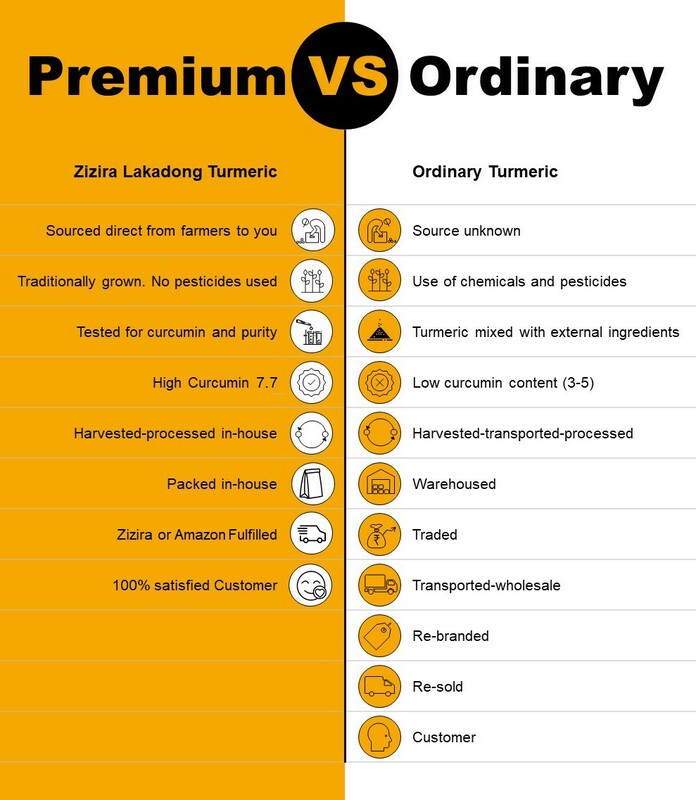 Zizira's Lakadong turmeric is high altitude turmeric that is of superior quality, strictly quality-controlled, and zero adulteration. From sourcing to the time it reaches your doorstep, we have taken steps to ensure that you get the best. Is a natural anti-inflammatory agent –it helps stops inflammation response. 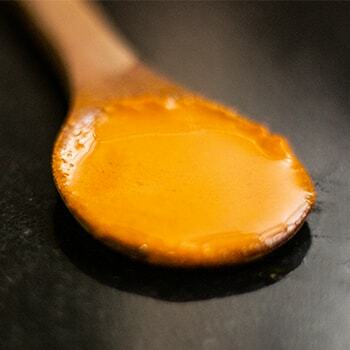 Turmeric paste is a powerful combination of turmeric and black pepper. Piperine increases the absorption of curcumin. Refrigerate the paste, store and use it in any season. This is the easiest way to increase the intake of curcumin. 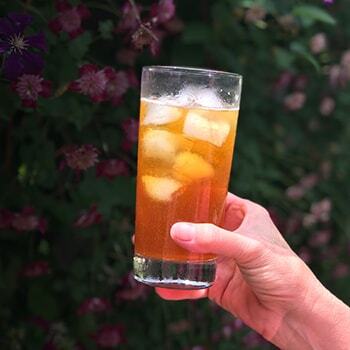 Turmeric tea is one of the most popular form of consuming the benefits of turmeric. It has a unique but a subtle flavour. This tea is lighter than the golden milk and is a combination of turmeric paste, honey and lemon. 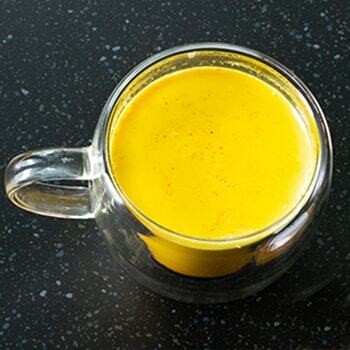 Golden milk (Haldi doodh in Hindi) is a delicious way of taking turmeric. It is a combination of milk with turmeric and coconut oil. The fat from the coconut oil and milk aids in the absorption of curcumin. A very traditional drink in India. Would you compromise health for low-quality? At Zizira, our motivation to provide clean, pure Lakadong turmeric is to fight against the ever-increasing problem of adulteration. Zizira sources from the source, the farmers who grow them. We select farmers who follow traditional farming practices. We learned that the adulteration problem happens, even at the source. Traders mix Lakadong turmeric with other varieties and pass off the resultant product as Lakadong. This is where Zizira wants to make a difference — to our customers, to the farmers, and to the land that produces this ancient wonder spice sought after all over the world. Roller-drum washer thoroughly cleans the turmeric under a jet of running water for 7-10 minutes. Hand washed in 3 wash basins to even squeakier clean rhizomes, cleared of all physical dirt. Food-grade containers finally drain off the excess water and the extra skins are removed. We send test samples to establish that Zizira’s Lakadong turmeric is free from unwanted contaminants such as heavy metals, chemical fertilizers, insecticides, pesticides, chemical dyes, and toxic elements. We also test the curcumin content of every batch of turmeric that we process. Only after getting the favourable test reports do we release our products to the shelves. We are eager that you get a genuine product that gives your money’s worth and peace of mind. According to research findings, turmeric has curative effects on over 581 diseases. Turmeric’s main bioactive ingredient, curcumin, alone has the potential to heal about 560 diseases. Curcumin is only one among 200+ constituents of turmeric. Turmeric is a sort of hero among medicinal plants. Zizira trusts You. If you are unhappy with our product, contact us. Request for a replacement product. We are committed to give you high quality products from Meghalaya. Why is the turmeric called Lakadong? It is grown in a region near the village of Lakadong in Meghalaya India. Lakadong is a very remote small village near the border of Assam. They have their own unique dialect that is only spoken by a few nearby villages. To communicate more widely they speak the broader tribal language of Khasi. Much of the farming near Lakadong is traditional slash and burn. This means that after a new wild plot of land is selected for growing, the weeds and brush are cut and burned then turmeric is planted. After a few years, the land is left to go back to weeds and regenerate. What makes Lakadong turmeric so special? There is a lot of speculation about this and there is no accurate answer. The opinions have to do with the quality of the soil, high altitude, cool climate, abundant rain, the ancient variety of turmeric and traditional farming methods. Lakadong Turmeric is known for its medicinal qualities. The Curcumin content in Lakadong Turmeric is between 6 to 7%, which is one of the highest, as against a mere 2 to 3% in most varieties of turmeric. 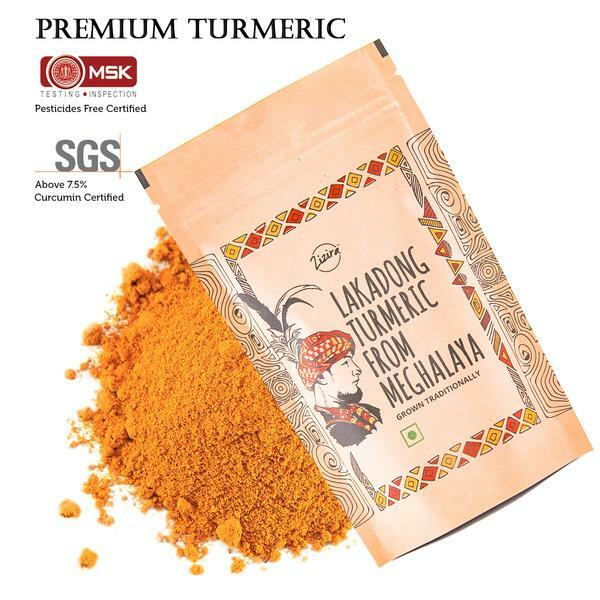 Lakadong Turmeric (Curcuma Longa) is indigenous to Meghalaya and obtained Geographical Indications(GI) tag by The Spices Board of India on 26th July 2015. Despite many of its clones, Lakadong's uniqueness has never been usurped. Where and how is the turmeric grown? The turmeric is grown on small family farms. Typical the work is done by hand by the farmer family and a few hired hands. Due to the hilly terrain and since farms are small, using equipment is not feasible. The rhizome is harvested from the ground from Nov – April. 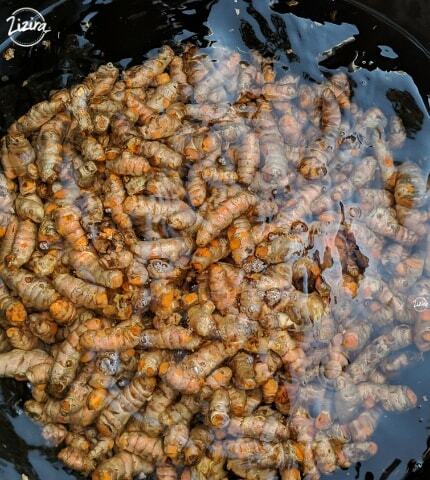 How is Lakadong turmeric processed? We set up a mini in-house processing unit to maintain the quality standard of our products. We invented simple low-cost bamboo solar dryers and wood burning dryers with aluminium heat exchangers. The turmeric is washed, sliced, dried, powdered and packaged by our own team. Do you buy from different farmers each year? We are trying to build long-term relationships with farmers so that we can work together to improve the quality of turmeric for our customers. We go way beyond fair trade. We partner with farmers enable them to benefit from processing. They can earn more and we can create greater value for our customers.